Camo-hatted bully in action. Photo by David Yamada. A man's haranguing of a young Muslim woman that started on the Green Line platform at Prudential Saturday ended on a trolley when several people stood up and put themselves between them, according to one of the participants in the incident. Read more. Kate Estrop found this stuffed animal riding the E Line all alone tonight, wonders if it belongs to somebody. Pat from Boston notes that Hynes station still has maps showing the E Line going all the way to Arborway (even if in the "temporarily suspended" format), something it hasn't actually done since Dec. 29, 1985. Around 530 p.m., a motor vehicle got up close and personal with both a bus and an E-Line trolley. Extensive damage to the car; no injuries. The Green Line is now suspended between Brigham Circle and Heath Street; riders are supposed to hop on a 39 bus instead. Outbound trolley halted by protesters. About 50 Northeastern students protesting in support of higher wages for both adjunct professors and people who make the minimum wage blocked the E Line at Forsyth Street for several speeches and chants this afternoon. Read more. It's Northeastern's annual underwear run, and thousands of students in their underwear are streaming down Huntington Avenue towards the Pru. A dead T bus on the tracks on South Huntington Avenue means the Green Line ain't going anywhere. Stuck trolley. Photo by Jon Frederick. 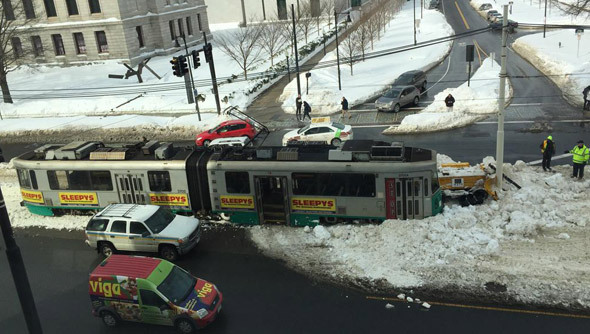 Michael Femia reports a trolley acting as a plow got stuck on Huntington Avenue by the Museum of Fine Arts around 12:30 p.m. Yacques reports it derailed and took out a street light and hit a pole. In the photo above, that yellow thing was the plow attached to the front of the trolley. See all those people? They're waiting for an Orange Line shuttle bus at Malden Center. "Shuttle bus line is MASSIVE!" Rich reports. Shortly before 5 p.m., a BPS bus driver somehow backed into an E-Line trolley near Mission Park, A.P. Blake reports. The three children on board the bus were taken to Children's Hospital just as a precaution; the E Line began terminating at Brigham Circle.